Fundamental design limitation resulting from plant structure and characteristics has been an issue of interest in control engineering, see, for example, [ 2]. In the text , the authors also explained how control performance could be improved when more inputs were available for feedback. In the case of motion control, cascaded velocity/position loop structure shown in Figure 1 is widely-used because the additional output (velocity) is easily measured by a tachometer, or computed from the shaft encoder pulses. A commercial servomotor drive often has a PID control for velocity loop, or a cascade PID velocity/position control already implemented. At the end of this article we include tracking response of cascade PID in our performance comparision. Remarks: we choose to focus on the concept and results and omit setup details for readability. The generalized plant formulation and weight selection is the same as explained in previous parts. and synthesize a velocity-loop H∞ controller. Perform the same procedure as in Part II to achieve a stable closed-loop system. Simulate time-domain performance. After we get a controller from step 1 that gives satisfactory performance, close the velocity loop with that controller and use the resulting closed-loop transfer function as the plant for next synthesis. Note that an H∞ algorithm often synthesizes a controller with higher order than necessary, so some model reduction technique such as balance truncration might be handy. Synthesize a controller and use it in the outer (position) loop. Construct an Xcos diagram for time-domain simulation like shown in Figure 2, using the same command and disturbance input as in the single-loop design. . The step and sine wave disturbance comparison in Figure 3 shows vast improvement on disturbance attenuation. Indeed, the advantage can be shown more clearly in Figure 4 by comparing the frequency response of the open-loop disturbance transfer function and the attenuation achieved from the closed-loop system. For a 1 Hz disturbance signal, say, the reduction achieved by single-loop controller is only about 15 dB, compared to 50 dB reduction in the cascade control case. 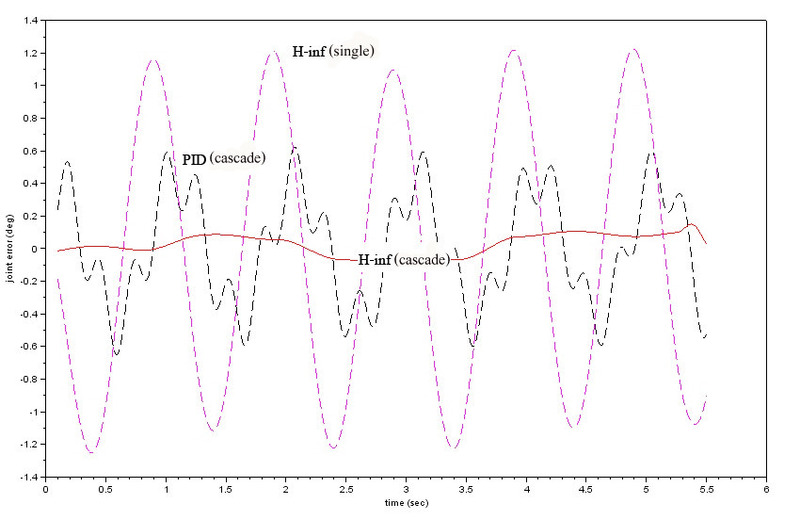 This confirms the time-domain responses in Figure 3. To observe tracking response under disturbance, we leave the disturbance input signal as is, but change the command input to a multi-segment trajectory (generated using RTSX). 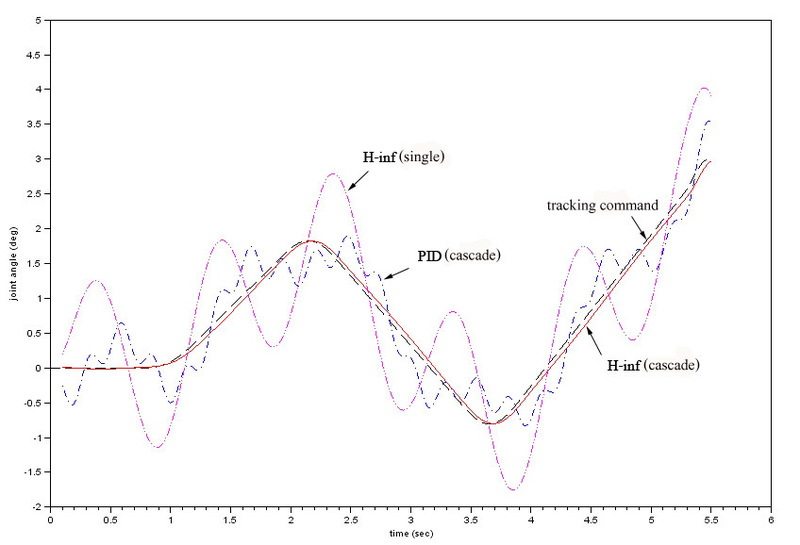 3 control schemes are compared: single-loop H∞, cascade PID, and cascade H∞. Figure 5 shows tracking responses, with errors plotted in Figure 6. The RMS values for errors in the three cases are 0.8403, 0.3405, and 0.0714, respectively. sk.dat Example of controller data for simulation (Type load(‘sk.dat’) to load data into Scilab workspace. Freudenberg J.S., C.V. Hollot, R.H. Middleton and V. Toochinda, “Fundamental Design Limitations of the General Control Configuration,” IEEE Transactions on Automatic Control, pp. 1355-1370, August 2003. Toochinda V., Robot Analysis and Control with Scilab and RTSX, e-book, Mushin Dynamics, 2014.